For hundreds of years the Manufacture Nationale de Sèvres has produced porcelain pieces to the highest standards of perfection. 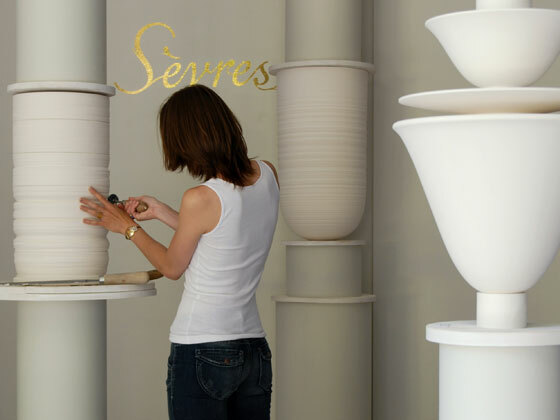 This year, Sèvres invited Platform 8 from the Design Products Department at the Royal College of Art to intervene in this history, in a small way, by investigating what this tradition means to contemporary design, and what contemporary design might mean for the future of this history. This installation—and the series of personal concepts, objects and projections it houses—asks two questions: was Voltaire right when he wrote (just five years after Sèvres became a royal factory in 1759) that ‘the perfect is the enemy of the good’? Or are these processes and standards legitimate guarantors of quality and value? The production of Sèvres is indeed exquisite, and if anyone in the world of handmade production has the right to make claims about perfection, surely it is Sèvres. Nevertheless, while it is possible to seek perfection within a well-defined and stable set of aesthetic standards, the aesthetic standards themselves must be evaluated relative to some particular good: more appropriate, more functional, more nostalgic, more interesting. The realization of a given set of standards can aspire towards perfection, whereas the standards themselves are merely better or worse. Voltaire’s adage can therefore give us some insight in the difference between the craftsman and the designer. Craft seeks the perfect, design seeks the good. With whom should we side? Are the productions of Sèvres too perfect—the enemies of the good? The perfect and the good require each other; the perfect realization becomes stale without being invigorated by good design. The good becomes lazy without the obsessive pressure of the perfect. The the seeming contradiction between the two may be indexed to a particular stage of historical development: the apparent enmity between the perfect and the good is just a stage in the long courtship between form and content in human creativity. Having said that, the question of Sèvres itself cannot be entirely answered in the abstract. It requires material interventions that enable us to imagine other possibilities and trajectories. Each intervention here provides a possible answer, and a new perspective on the problem.